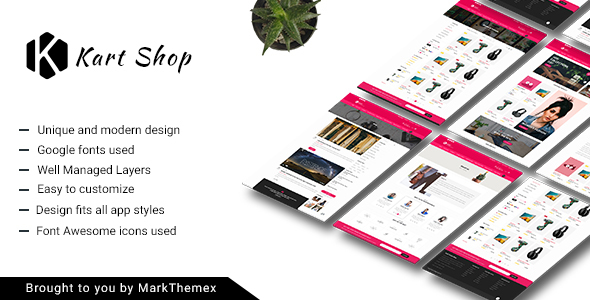 Kart is a light, modern, pretty and fresh design for Ecommerce Shop. This design is suitable for small and big projects. There are 10 unique PSD files where you can find most type of pages is ready to use, like category page, product page, etc. In this psd template you can easily customize. Every group and layer have relevent names so that you can easily modify or use the template. Kart has been designed for woocommerce, opencart, magento, prestashop, shopify and other small ecommerce platforms in mind. Kart design is multi-pupose, and will be excellent for clothes, electronics, books, furniture, shoes, etc. Note: All images are just used for preview purpose only and NOT included in the PSD files. if you have a question, feel free to contact me. If you need any help using the file or need special customizing please feel free to contact me via my Themeforest profile. If you have a moment, please rate this item, I’ll appreciate it very much! Thank you.